David Felten and Jeff Proctor-Murphy are Methodist ministers who felt a need for resources for people and congregations who want to explore questions that most churches are unwilling to ask. So they created the DVD series, Living the Questions. They bring scholars and leaders to talk about matters of faith and scholarship that address real questions we all have. 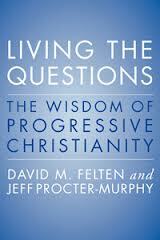 They recently put some of these programs in book form by coauthoring Living the Questions: The Wisdom of Progressive Christianity. David spent some time with me on Religion For Life to talk about questions that need asking! Thursday, August 1st at 8 pm on WETS, 89.5. Sunday, August 4th at noon on WEHC, 90.7. Sunday, August 4th at 2 pm on WETS, 89.5. Monday, August 5th 1 pm on WEHC, 90.7. Wednesday, August 7th at 6:30 pm on WEHC, 90.7.